Cooking With Mickey: Jamie Oliver's Food Revolution is Back!! 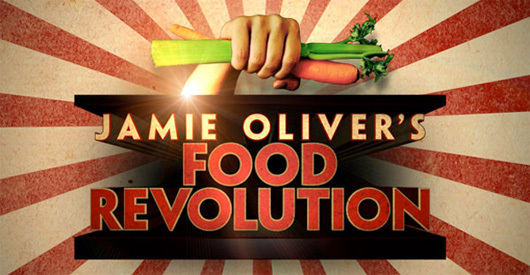 Jamie Oliver's Food Revolution is Back!! For those of you that missed the first season of Jamie Oliver's Food Revolution, he is back again fighting for healthy food in school. This season he's taking on the Los Angeles school district, which he has been banned from. He'll be fighing this tooth and nail as we know from last season. He doesn't back down from a fight! What are your thoughts on Jamie trying to bring healthy foods into the American schools? Are you all for it or could you care less what it is that your kids get at school? For those of you that are moms and dads... I'd love to hear what you think. So glad Jamie's Revolution is back! I love the show and love the message.